We all know the story. Francis Scott Key, a young lawyer from Georgetown, witnessed the bombardment of Fort McHenry, which lasted for twenty-five hours, from September 13 to September 14, 1814, during the Battle of Baltimore in the War of 1812. At first light, after the cannon fire had finally ceased, the sight of the flag known as the “Star-Spangled Banner” still flying over the fort inspired Key to write a poem called “Defence of Fort McHenry,” which became the lyrics for our national anthem. A stirring and significant moment in American history. The successful defense of Baltimore marked the turning point in the war. Fort McHenry should be a national historic shrine, and indeed it is, but here’s the view from Fort McHenry today. This is a strikingly industrial, perhaps more mid-twentieth century than contemporary, view. The unstated but clear implication of this posting is that this view is unfortunate and that the “viewshed” should be returned to something resembling that of 1814. At some level I am sympathetic with this line of thinking. But, as I thought about the boundaries and criteria for deciding what kind of viewshed (and other) restoration is appropriate I became more troubled. Then I thought of how we might apply Carole’s Fort McHenry example to a city whose history I am much more familiar with, Boston. Go to Dorchester Heights to visit the location of the canon emplacements that George Washington built to force an end to the British occupation of Boston in 1777. Here is where an amazing feat of endurance brought canon, dragged all the way from Ft. Ticonderoga in the dead of winter, to bear on the British army and fleet. In one day Washington ended the occupation and effectively closed British military presence in New England. This sight may not have inspired a poem, but it was of enormous strategic importance to the conduct of the Revolutionary War. 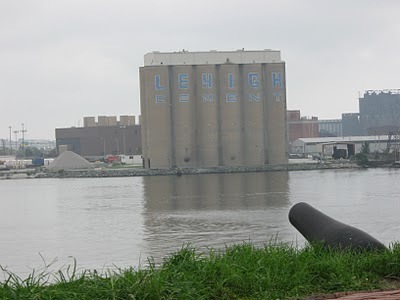 So, this viewshed is arguably as worthy of protection as the one from Ft.McHenry. What you see from Dorchester Heights is a view shed of a city completely transformed by great feats of 19th century civil engineering. To return this to it’s condition in 1777, you would have to tear down the Bulfinch-designed state capital (hidden in the photo by the mass of downtown buildings) and return 60 feet of soil to the top of Beacon Hill from the harbor where it was pushed by early 19th century real estate developers. Then you would need to haul all of the 30 or more feet of material brought into Back Bay back out to Needham. Large parts of Cambridge would be returned to salt marsh including the site of most of MIT. Harvard Stadium and the Harvard Business School would meet a similar fate. And the list of changes would go on and extend into the 20th century with the elimination of Logan International Airport, built on filled land in the 1930’s. Now you might complain, with good justification, that I am carrying this to absurd lengths. But, how are we to decide where restoration(or preservation)of viewsheds is appropriate? What are the principles that we can apply? What is on the other side of that Lehigh Cement1 storage facility? More industrial uses? Would it be OK to have housing there? Where one person sees an ugly industrial structure I see wonderfully massed cylinders connecting two modes of transport (ship and train) to supply one of the fundamental building materials of our society. 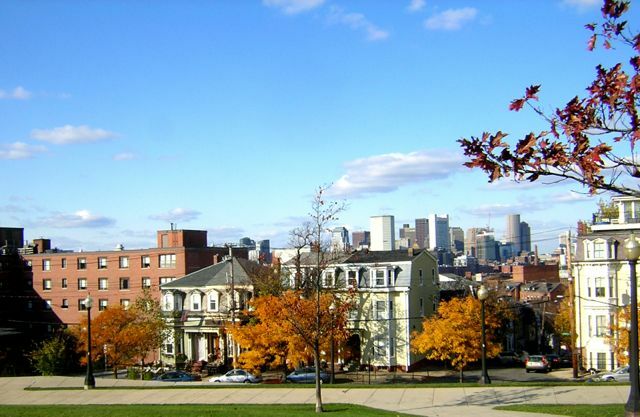 Or, to extend our visit to Boston, should the industrious people of the 19th century not leveled the original five hills of Boston to more than double the land area of the city. Should the vast project of filling the Back Bay not been undertaken and Commonwealth Ave. never built because we had to preserve things as they were at some entirely arbitrary moment of earlier history? Where are the principles to guide preservation and restoration ventures?